For Word 97-2004 see Understanding Styles in Microsoft Word. Use Heading Styles to Enable quick and easy navigation of a document. Create a Template Part 2, John McGhie, MVP. The AutoText list restricted by Styles for the salutation and closing. Insertion of the typist's name as signer automatically by accessing the Author document property. IncludeText Field Tutorial - 2 documents with IncludeText links demonstrating switches, interaction of Styles, and use of hidden Page field for continuous page numbering of separate documents. Headers? Headings? What is the difference? How to add pop-up lists to any Word document by Bill Coan, MVP. Word is always making changes I don't expect. How can I get more control over my formatting? by Suzanne S. Barnhill, MVP, and Dave Rado, MVP. So You Want to Write a Book Using Microsoft Word - extensive tutorial by MVP Daiya Mitchell with overview of Styles, Templates and Sections and the interactions among these tool/features. Excellent! Not just for those who want to write books! 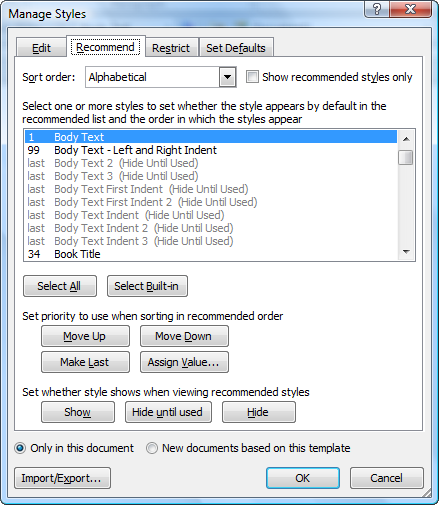 Word Tips about Styles from Allen Wyatt - Note, most tips have versions for Ribbon versions of Word (2007+) and pre-ribbon versions. A few of the tips are listed below. (Advanced) How to safely update a document's Styles from its template without using the Organizer (and how to make the Tools + Templates and Add-ins dialog safe) by Dave Rado, Margaret Aldis, Ian Sharpe and Beth Melton. How to Control Bullets in Microsoft Word by Shauna Kelly, MVP. Bullets and outline numbering are very much related in Word. You use Styles to implement either in a reliable way. Changing the formatting rules with compatibility options - these can change how Word treats formatting in Styles. This page is a companion to Understanding Styles in Microsoft Word. 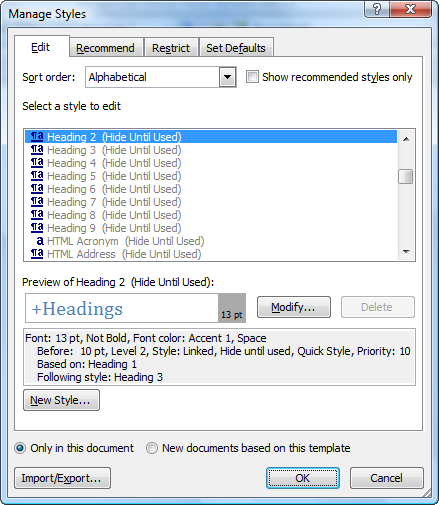 It is to examine the handling of Styles in the Ribbon versions of Word. All of the concepts are the same but the Ribbon versions give more controls and ways to access Styles. Styles are arguably the most important feature in Microsoft Word. Why? Because everything that you do in Word has a Style attached. The definition of a Style is two-fold. First, you can think of a Style as a set of pre-defined formatting instructions that you can use repeatedly throughout the document. Let's say each heading in a document must be centered, uppercase, bold, and a slightly larger font size. Each time you need to apply formatting to the heading, you have to go through the entire process to get the text the way you want it. If you store the formatting commands in a Style, you can apply that Style any time you need it without having to do all of the reformatting. Possibly more important however is that Styles are used to "tag" or identify parts of a document. An example of this is whether text is part of a heading, a footnote, a hyperlink, or body text. These are all examples of Styles in Word. If you're concerned about whether or not you need to learn Styles, we can put it rather simply: you do. Styles are the architecture upon which Word is based. Just about everything in Word is Style-driven. In fact, many people in the industry refer to Word as a "Style-driven" program. "While the Styles gallery has been available on the Word home tab since Word 2007, some people just assume Styles are meant for people who want big blue text. "As it turns out, that’s not true. I’m here to tell you that Styles are handy, and if you use them to format your text as you write your document, you’ll be able to take full advantage of the improvements in Word 2013 that we’ve outlined below." CK Note: For long documents, documents that are likely to be heavily edited, and documents that may form the basis for other documents, follow the basic rule that to change formatting use Format => Styles... Do not apply direct formatting. In Ribbon versions of Word (2007+) this is even easier, click on your Style from the Quick Styles gallery! You will save yourself, and others, untold hours of hair-tearing. For shorter one-use documents, direct formatting is OK; you'll only regret not using Styles about one time in six, on the other five out of the six, you'll save a bit of time. If you create document templates with direct formatting, you deserve what will happen to you when someone finds out (and it won't be nice). In my opinion, using direct formatting in document templates intended for use by others rates the words malicious and/or incompetent. If the templates are for your own use, you deserve the loss of days, months, even years from your life that you'll spend fighting with Word and trying to figure out why your documents look so bad. Trying to use Word without understanding and using Styles is like pushing on a string. I resisted learning and using Styles for years and now regret every day of those years because although that string was still very hard to push, it kept getting longer and longer, and had some very important projects tied to it! Once you understand Styles and the Word concept of organizing things into Chinese boxes everything falls into place and instead of pushing a string, you can push a button that turns on the very powerful text processing machine known as Microsoft Word and it will start doing your work for you instead of running around behind you trying to undo what you thought you just did. These statements should be even stronger for those using Word 2007-13. These versions let you use and change Styles even more easily. I just had occasion to edit a 100-page document that was created without using Styles. It was formatted completely with direct formatting. Each page ended with a page break. Each time it had to be saved, the save took more than 60 seconds, during which time Word was frozen. A similar-sized document formatted using Styles takes less than 3 seconds for me to save. When a page break must be forced, instead of using a manual page break, the paragraph to begin the new page is formatted using a Style that has "page break before" paragraph formatting. This difference was due entirely to the document being directly formatted - a much higher level of complexity. Each paragraph mark in a directly-formatted paragraph carries with it up to fifty different formatting commands. When formatted using a Style, that paragraph mark will carry with it one command - use this Style! Tip Microsoft recommends that you use numbering linked to Styles to get the best result for numbered paragraphs, outline numbering and lists. CK Note: See How to create numbered headings or outline numbering in your Microsoft Word document by Shauna Kelly and Word's Numbering Explained by John McGhie. Consistency — When you use Styles to format your document, each section is formatted the same and therefore, provides a professional, clean-looking document. Easier to Modify — If you use Styles in your document consistently, you only need to update a given Style once if you want to change the characteristics of all text formatted in that Style. Efficiency — You can create a Style once, and then apply it to any section in the document without having to format each section individually. Table of Contents — Styles can be used to generate a table of contents quickly. Faster Navigation — Using Styles lets you quickly move to different sections in a document using the Document Map feature. Working in Outline View — Styles allow you to outline and organize your document's main topics with ease. Legal Outline Numbering – Numbering, when linked to Styles, allows you to generate and update consistent outline numbering in legal documents, even ones with complicated numbering schemes like municipal law, tax law, and mergers and acquisitions documents. Efficiency of Word — Files which are predominantly manually formatted are less efficient than those which have formatting that has been imposed by Styles: manually formatted files, such a converted documents which have been File, Opened, are bloated in file size (bytes) and do not render to the screen efficiently when you scroll through them. This is because Word is a Styles-based application: it first reads the attributes of the underlying Style, then has to broadcast anything contrary (e.g. manually formatted on top of that). As such, a lengthy document that has been predominantly manually formatted, will behave sluggishly because Word has to work harder at managing it. Additionally, the print formatting processes are equally labored as opposed to using Styles. HTML AND XML — What lies ahead? A fully structured, Styled document will move into HTML and XML incredibly well. Character Styles can be applied to individual words — even (you guessed it) single characters. Character formatting is built from the formatting options available from the Format menu, by selecting Font; settings from the Tools menu, by selecting Language, and then selecting Set Language; and in certain cases from the Format menu by selecting Borders and Shading, and looking on the Borders and Shading tabs of the Borders and Shading dialog box. The following table shows the formatting that can be in a Style. There are actually five Style types in Word. Each has an icon that appears next to it in the Styles and Formatting task pane. 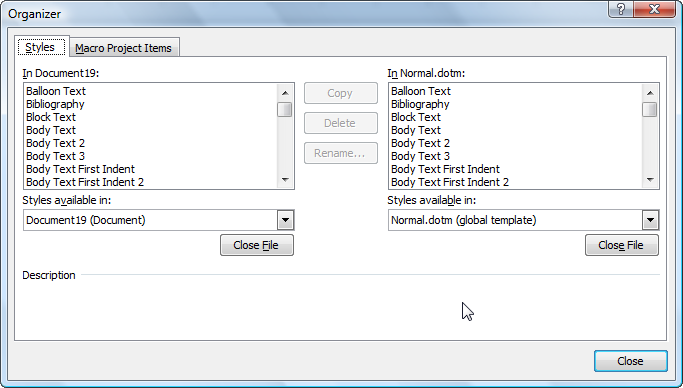 When you use the New Style dialog box to create a new Style, the types are available on the Style type list. Paragraph Applies to all the text within the end paragraph mark of where your pointer is positioned. Character Applies at the character level—to blocks of words and letters. Linked which can be used for paragraph or character formatting. When used on particular text within a paragraph, they act as character Styles, when applied to a paragraph, they act as character Styles. See linked Styles. List . Provides a consistent look to lists. Table . Provides a consistent look to tables. I have three character Styles in most of my pleading documents. Two replace Bold and Italic formatting. The third is for citations. The first two are built-in character Styles of "Strong" and "Emphasis." I started using these before Word had a replace formatting feature. I'm not sure they are needed. They provide a simple way of changing how I emphasize something throughout a document by simply changing the Style. It starts out that "Strong" is bold and "Emphasis" is Italicized. The third, though, has proved its worth through time. It is the Citation character Style. I set it to Italic and set the language formatting to "no proofing." This means that case citations with it will not alert the spell checker. (Of course, this also means you better have the correct spelling.) It also disables automatic hyphenation. To set this up, you would create a new character Style and use the formatting drop-down to add the Italic and "no-proofing" formatting. The Italic formatting comes through the font formatting dialog, and the "no-proofing" comes through the language dialog. In later versions of Word "no-proofing" is known as "Do not check spelling or grammar." Character Styles can also be used as targets for the StyleRef field. This field gives very quick automatic updating. A character Style is much less fragile than is a bookmark when used to mark text that may be edited. I will often use character Styles that apply to only one word or phrase in a document that I want to repeat elsewhere, instead of a bookmark. Then a StyleRef Field is used instead of a Ref field to repeat it elsewhere. The built in heading Styles in Word have special properties that make them almost magical. There are keyboard shortcuts for the top three. They can appear without any customization in a Table of Contents generated by Word, you can link and navigate to them with cross-referencing features, and more. See Why use Microsoft Word’s built-in heading Styles? by Shauna Kelly, MVP, for sixteen reasons to use these Styles. The primary reason to do this is when you want a snippet from the beginning of a particular heading to appear in a Table of Contents but don't want the entire heading in the Table of Contents. The screenshot above, with non-printing formatting marks displayed, shows two different paragraph Styles used in one logical printed paragraph. Note the pillcrow (paragraph mark) with the dots around it separating the two. The colors of the Styles here are different. The usual use of this, though, would be for the Styles to look the same. This was used in automatically generating the Table of Contents. The second part of the paragraph, in the non-heading Style did not get picked up in the Table of Contents. You would not want to base the second Style on the heading Style though, because then it would also be a heading Style. This is, instead, based on the Body Text Style and formatted using the same font and size as the Heading 1 Style. You can add a Style Separator to the end of a paragraph using the Ctrl+Alt+Enter Keyboard Shortcut. Then you add your text for the separate Style. See this thread on the Microsoft Answers forum for more. Styles are listed in at least two places. The one most users are familiar with is the Quick Styles Gallery on the Home Ribbon. The resulting dialog is similar to the Styles Pane and provides more information about the Style when you hover. As in earlier Word versions, hovering over the Style name gives a pop-up with information about the Style, and right-clicking on the Style name give options to modify or delete the Style. By default this appears as a floating dialog. This dialog can be anchored to the right side of the page making it appear much like the Styles and Formatting Pane. Double-click on the title area (Styles) to anchor it. Drag that title bar into the page to float it again. In Word 2007 and later at the bottom of this Style pane there are two checkboxes, three buttons, and the Options... choice. The Show Preview checkbox shows the Styles in the list as previews of the Style. 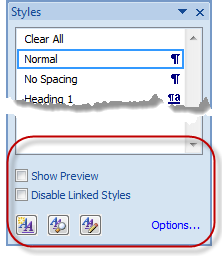 The Disable Linked Styles checkbox changes how applying a linked Style in a document behaves. If "Disable" is checked, the linked Style behaves as a paragraph Style only when applied to a part of a paragraph. That is, the Style is applied to the entire paragraph, not just the selected portion. The left-most button lets you define a new Style. The second gives you the Style Inspector. The Style Inspector is a floating dialog that lets you type in your document and click to a different spot in the document to see what is going on with formatting there. If the advanced editing option to "Keep Track of Formatting" is checked it will also show direct formatting. The purposes of the buttons is shown in the tooltips in the screen shot. The Reveal Formatting button gives the user the same pane as the Keyboard Shortcut Shift+F1. The third button gives you the tabbed dialog to "Manage Styles." The Manage Styles dialog has four tabs at the top giving access to four different sets of controls to manage Styles. At the bottom of each tab of this dialog are choices for "Only in this document" or "New documents based on this template" as well as the buttons for Import/Export, OK and Cancel. The choices for the "scope" of the change (this document/template) are applied when the OK button is pressed under any of the tabs. You can set options under each tab before pressing OK. If you change your mind before pressing OK and cancel, none of the changes under any of the tabs are applied. Font - sort first by font being used - then alphabetically - Many Styles, by default, are based on the Theme fonts +Headings and +Body. If you are using Themes, you want to keep them this way. Based on - sort by base Styles - see How Styles in Microsoft Word cascade . Note the Heading Styles shown below are set up as recommended in the article, not the way they come by default. Next to the Sort order choice is a checkbox to "show recommended styles only." If this is checked you will only see styles that are not hidden. (See Recommend tab) These choices set at the top of any tab of the Manage Styles dialog carry over to the other tabs in the Manage Styles dialog. Unlike choices made on the Styles Pane Options dialog, they do not change display of Styles in other Word dialogs. The first tab is Edit. The controls under the Edit Tab are basically the same controls you have when you right-click on a Style name in the Styles pane. You can modify a Style or create a new Style using the buttons on the Edit tab dialog. You can see a summary of the Style's definition just as you do when you hover over the Style name in the Styles pane. Shown to the left is the Recommend tab which lets you assign recommendation values and mark styles to be hidden or displayed in lists. Those values determine where Styles show up in the Quick Styles gallery and the order if you display Styles "as recommended." Styles can have the same values, in which case they will be sorted alphabetically. It also lets you hide Styles from various views either until used or always. The Restrict page lets you make certain styles unavailable to the user of your document/template. The Set Defaults page lets you change the default settings more globally. Note, changing from +Body or +Headings may divorce you from Style Sets settings and/or Themes. When the OK button in the Styles Pane Options dialog is clicked, it changes not only the Styles Pane display but also how Styles lists in other Word functions are displayed. The Styles display in the Find/Replace Styles formatting lists is changed by the sort order picked in the Style Pane Options dialog! If you've added the Styles Box to your QAT, that display is also changed by this dialog. If you choose to show Styles "in Use" you will see all Styles currently (or previously) used in the document. If you choose to show Styles "in current document," you will see Styles currently (or previously) used in the document plus at least the Heading 1 style. If you choose "Recommended" the list will follow the settings in the Manage Styles - Recommend dialog. The screen shot above shows two tools for using Styles on the QAT. 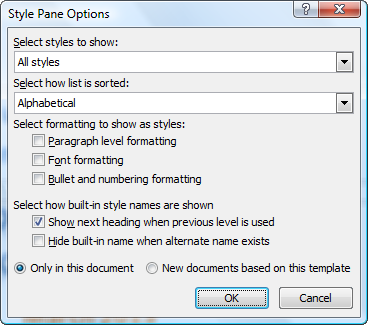 The first is the Style Box drop-down (extended here) from earlier versions of Word. The second launches the Styles Pane. The Style Box will always display the Style in use where you are typing. You can type a Style name into the box to change to that Style. You can also drop it down to pick a Style. Locate the Style box on the Formatting toolbar. If the toolbar is not visible, alternate-click any toolbar and choose Formatting. All other Styles listed alphabetically. Click the Style box drop-down arrow to the right of the button. A list of Styles available in the active document displays. Styles list in Word 97-2000. When you select a Style from the list on the left side of the Style box, you see a preview and description of the Style formatting on the right. From the Format menu, choose Style. Change the List to display All Styles if necessary. Select a Style from the list and view the Character preview, Paragraph preview, and Description. Click Cancel or press ESC to close the Style dialog box. Click the Style drop-down arrow. Notice how many Styles are available. 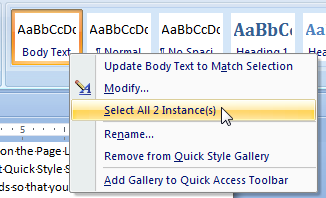 Click with the mouse in the document to deselect the Style drop-down list. Hold SHIFT and click the Style drop-down arrow again. More Styles are available when you hold down the SHIFT key. The same rules that apply to direct formatting of text apply to Style formatting of text. If you want to apply a text attribute to a single word, you can click anywhere in the word and select a formatting option such as bold, italics or underline — Word applies the selected format to the entire word. Similarly, if you want to format multiple words you must first select the multiple words. The same is true for applying character Styles. To apply a character Style, you can click in the middle of any word and select the character Style to format the entire word. If you want to change a group of words you must first select the text before applying the character Style. Applying formatting to paragraphs is a little different. Just click anywhere in a paragraph and apply direct formats such as dragging the ruler to change indentation — since paragraph formats affect an entire paragraph, you don't have to select the paragraph. If you want to affect multiple paragraphs, you must first select the multiple paragraphs. And, similar to applying text formatting and character Styles, to apply a paragraph Style, click within the paragraph and apply the paragraph Style. Or, select multiple paragraphs to apply the same Style to each of the selected paragraphs. CK Note: As of Word 2002 (and later) if you attempt to apply a paragraph Style to selected text within a paragraph, you get a new character Style with the same name. The character formatting from the paragraph Style is applied, but not the paragraph formatting. A new hybrid character Style with the same name but with "char" appended is created. To apply a paragraph Style to a single paragraph, click within the paragraph without selecting text. Type the following text into a new document. Click anywhere within the first line, Profitability Report. Click the Style drop-down arrow and select Heading 1. Select the two paragraphs: Entire Firm and Individual Departments. Apply Heading 2 Style to the selected text. Apply Heading 3 Style to the department names. Tip The above shortcut keys are standard in Word documents. You can also assign a shortcut key combination to any other Styles that you use regularly. This topic is covered in the section Assign a Keyboard Shortcut To a Style. From the View menu, choose Normal (Word 97-2003). From the Tools menu, choose Options and select the View tab. Locate the Style area width box. Click the up spin box arrow until it's set to 1.0, or type 1.0 in the box. From the Tools menu, choose Options, and select the View tab and set the Style area width back to 0. 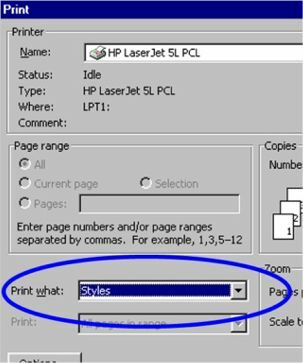 You can print a list of the Styles in use in a document along with the formatting that goes into that Style by selecting "Styles" in the "Print What" box on the Print Dialog Box instead of printing the document. From the Edit menu, choose Replace. If you prefer keyboard shortcuts, press CTRL+H. Click More on the Replace tab, if necessary, to display additional options along the bottom portion of the dialog box. If a button says Less, the window is already expanded. Delete any text, if necessary, that may appear in the Find what and Replace with boxes. Click in the Find what box and click Format. Select Heading 2 in the Find what Style list and click OK.
Click in the Replace with box and click Format. Select Heading 1 and click OK. Note that while there is no text within each edit box (Find and Replace), just below each box is a message that Word will find and replace Styles that are applied to text within the document. Click Replace All, then click OK, and finally, click Close. Type your first name on a separate line in a document. Select your name and make the font Blue. Change the font size to 24-points. Apply Bold and Underline formatting to the text. From the Formatting toolbar, click in the Styles box (where the Style name Normal is usually displayed). Press ENTER. This step is important. If you do not press ENTER your Style is not created. Click the Style drop-down list. You should see your newly created Style. Test this by typing "This is a test" and applying the new Style. Select the text "Styles help users in law firms master Microsoft Word." and the paragraph mark ( ) that follows. Center the paragraph and apply a 14-point font. Type My Style as the Name. Add several paragraphs to the document from the previous exercise. Apply the Style that you created to the new text. 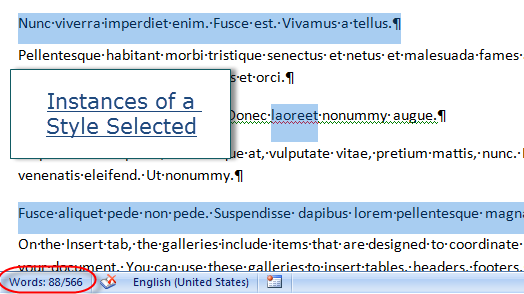 Select the text Styles help users in law firms master Microsoft Word. Click Format, and then select Font. Change the font color to Blue and the font size to 20-points. Close the dialog box and apply the changes that you've made by clicking Apply. Notice that all text formatted with My Style updates to show the recent change. Select the text Microsoft Word. Change the font size to 36. Click on the Style name in the white part of the Style toolbar button (not the drop-down arrow) and press ENTER. It's important to press ENTER and not move the mouse up or down the list of Style names. This tells Word that you are working with the current Style where the mouse is active. If this step was done correctly, the following Modify Style dialog box should display. You can either choose to Update the Style to reflect recent changes, or Reapply the formatting of the Style to the selection (go back to the original Style format). Choose Update the Style to reflect recent changes? And click OK.
CK Note: This behavior changed in Word 2002. You can modify Word to go back to the previous behavior. Check the box for "Prompt to update Style" on the Edit tab of Tools > Options. You can download an Add-In that restores the CTRL+SHIFT+S behavior from my downloads page. Do not ever check the box to automatically update the Style from now on. This is the equivalent of giving a chain saw to an 8-year-old without supervision. Nothing good will come of it! Tip A keyboard shortcut is to press CTRL+SHIFT+S (to put you in the Style drop down box), and then press ENTER, which will bring up the above dialog. Warning We do not recommend selecting the Automatically update the Style box especially in a legal environment where multiple users work on the same document. This feature will update the Style each time you make a formatting change in a paragraph that has a Style attached. Check the option to Add to template. This makes the Style available for any new documents that are based on that template. Note Documents that have previously been created based on this template are not affected when you add a Style to the template. To automatically update Style changes in templates and files previously created based on the same template, from the Tools menu, choose Templates and Add-Ins. 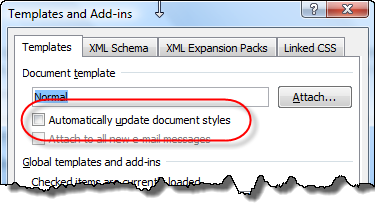 Select the option to Automatically update document Styles and click OK. We recommend not checking this option. It can produce unexpected results, especially in legal documents that must conform to court rules. CK Note: For an excellent tutorial on Styles and a methodical look at basing Styles on one another and reasons not to base Styles on normal, see John McGhie's Create a Template Part 2. For a sample demonstrating Styles based on one another, use of the Style for following paragraph feature, and the AutoTextList field restricted by Styles download the Letterhead Textboxes and Styles Tutorial by Charles Kenyon. What it means to have a Style (Style B) based on another Style (Style A) is that changes in Style A, the underlying Style, will be reflected in Styles based on it (Style B) unless the new Style has deviated from Style A on the feature being changed. When you save a Style to the template, if that template is the normal template, the Style will be available in all new documents. In a blank line on your document, change the left indent to 1", and the right- indent to 5". Click somewhere within the indented paragraph. You will create a quote Style that is very common in most law firms. In the Name box, type Quote. As Style type, select Paragraph. Based on should be Normal (your default Style). Click anywhere within your document and press ALT+Q. The Quote paragraph Style is applied. Note If you want to add a shortcut key to a Style that already exists, Word lets you do that, too. From the Format menu, choose Style. Select the Style to which you want to add a shortcut key and click Modify. Click Shortcut Key and follow the steps from the above exercise. If you apply a paragraph format in Word, it keeps that format until another one is chosen. This is true for Styles as well. 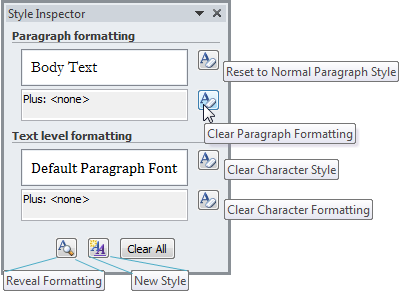 If you use the "My Style" Style (created in the previous exercise), Word continues to use that Style each time you begin a new paragraph until another Style is chosen. Sometimes the Style is only needed for one paragraph at a time (for example a heading Style). To cut down the amount of times the user needs to use the Style menu; you can choose which Style should be used in the paragraph that follows the new Style. For example, after the Heading Style, when you press ENTER, you can have the next paragraph automatically formatted with a Body Text Style. Select Quote Style from the list of Styles. Select Normal Style from the Style for following paragraph list. Notice the Style of the new paragraph automatically changes to the Normal Style when you press enter after a paragraph formatted with the "quote" Style. CK Note: See Letterhead Textboxes and Styles Tutorial for an example of Styles that use the "Style for following paragraph" feature to good effect. 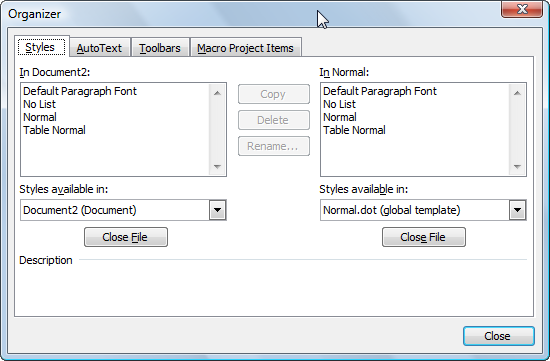 Word 97 Styles Organizer (above) - note AutoText and Toolbars tabs! Word 2003 is the same. 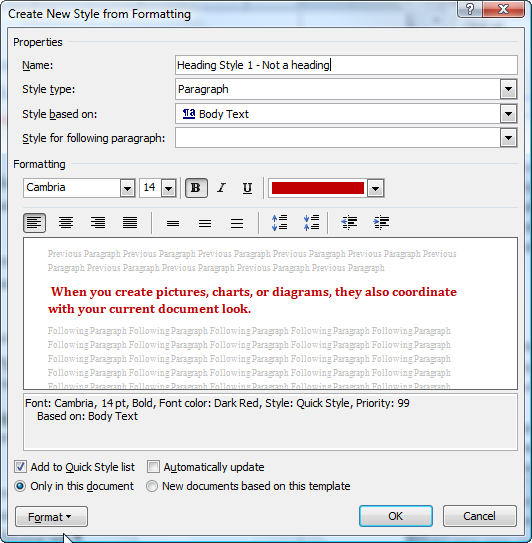 Word 2010 (2007, 2013 the same) Styles Organizer. 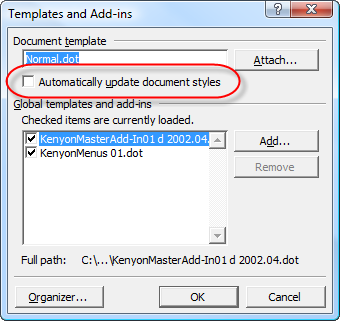 CK Note: To get to the organizer in Word 2010 and 2007 you need to click on the Import/Export button on the Manage Styles Dialog Box (bottom left corner). From the Tools menu, choose Templates and Add-Ins. Select the appropriate tab for items that you want to copy. For example, to copy Styles from one document or template to another select the Styles tab. To copy Styles from your current document to the Normal.dot template which makes the Style available each time you start Word, select the Styles and click Copy. Note If a Style name that you are copying already exists, you are asked if you want to replace it. Charles Kenyon Note I have found it best when copying Styles using the organizer to copy them three times if any of the Styles is based on other Styles or is followed by other Styles. I'm not sure why this makes a difference, but I've found that clicking on that copy button three times means that these relationships continue in the destination template. I know that when I copy them only once, they do not and the Styles are then followed by the Normal Style. See this Knowledge Base article Q113106 for possible explanation. Since at least Word 2003, the Organizer will not necessarily show all of the Styles in the Normal template. See below in troubleshooting. You can use a global template as a Stylesheet if you include a macro to copy the Styles into your document. See A Global StyleSheet in Microsoft Word? for an example of such a macro. If you have defined one of the built-in Styles just the way you want but would prefer to be using a Style of your own for this purpose, copying the formatting to your new Style without it being based on the existing Style. If you are comfortable editing vba macros, you can record a macro that calls up the Style modification dialog and goes through each of the various format dialogs and closes them. Then create your new Style and edit the macro to refect the name of your new Style rather than the one in which it was recorded. Run the macro and the new Style should match your original one. Much simpler is using one of the tools that comes in the WOPR Add-In. The Style Duplicator lets you create a new Style with the same definition as an existing one. The WOPR Add-In is only available with Que "Special Edition" books about Office and is worth the price of the books by itself. Another way to copy Styles is to simply copy and paste paragraphs created in another document containing the Style you're looking for. All paragraph formatting is contained in the paragraph mark at the end of each paragraph. Make sure when you select and copy the paragraph text that you include the paragraph marker at the end of the selected paragraph. Then, when you paste it into the target document, the selected paragraph formatting and paragraph Style are added to your target document. This method of copying Styles by copying text with a paragraph marker only works if the Style being copied in is not already "in use" in the document receiving the copied text. Otherwise the Style definition in the target document governs. If you do this and the Style already exists in the new receiving document, the existing Style in the receiving document is used, not modified. This makes it much easier to maintain consistency within a document but can lead to real headaches if the people who formatted the documents weren't conscious of Style use. In this case if you wanted to copy the Style you would want to use the Organizer. Character Styles are also copied this way. This gets complex. Sorry about that. Despite this complexity, use of Styles for formatting is the key to using Word. If you have text in two different documents that you want to combine, and you want to retain the formatting from each rather than having one Style system format the text from both documents, you can. You can use Paste Special ... as Word Document Object. This creates a document within a document, with its own set of Styles. Otherwise, if you just want to copy the text, you will need to make some changes to one of the documents before you do the insertion, though. The thing is that if your Styles have different names in the two documents, then the formatting will be retained when the text is inserted. So, you'll want to rename the Styles in one (or both) of your documents. None of the built-in Styles can be renamed, though. If you have the WOPR Add-In, you can copy Styles within a document and then use replace to change all instances using one of the built-in Styles to the copy (with a different name). If you have problems with copying formatted text from one document to another, take a look at the troubleshooting section below. If you have other formatting problems such as headers and footers or page numbering to worry about, take a look at Sections, Header and Footers. If you apply heading Styles, you can use the Document Map feature in Word to quickly move to different parts of your document. This is a real time-saver when working with long documents. See warning below! Create or open a long document formatted with heading Styles. 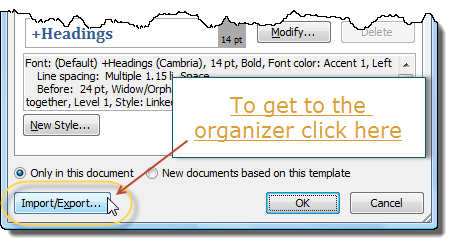 Click the Document Map button on the Standard toolbar, or from the View menu, choose Document Map. Click on a heading within the document map to move to that section in the document. Click on a different heading in the document map to move to another section within the document. "While it's true that Microsoft put a Document Map feature into Word 97, the whole thing was so badly botched that only a masochist would live with it. Here's the primary problem: Word 97 takes it upon itself to scan every document as it's opened and assign heading levels to all the paragraphs. By doing so, any heading levels you've assigned are thrown away--and there's nothing you can do about it. "So here's a word of advice. If you use DocMap on a particular Word document, don't let anybody with Word 97 (or any earlier version of Word, for that matter) open the document. As soon as your carefully DocMapped Word 2000 document is opened in Word 97, all the level formatting will be irretrievably lost." Quote from Woody Leonard Teaches Office 2000. The Document Map feature causes problems in all versions of Word up through Word 2007. Do not use it. In Word 2010 it was replaced with the Navigation Pane which works nicely. AutoText lists are an implementation of the AutoTextList field. They are found on the Header and Footer Toolbar and the AutoText toolbar. They are also in a number of the templates supplied with Word. A non-apparent factor with their use is that they are sensitive to Styles. 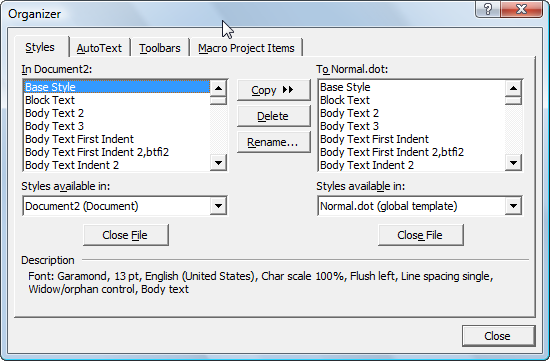 AutoText entries are organized by Word according to the Style in which they were created. Often only AutoText entries saved in a particular Style will show up in an AutoText list field. When such a list is missing entries, the first thing to check is whether the insertion point (cursor) is in the expected Style. See the Web Resources page for more on AutoText. See How to add pop-up lists to any Word document for more on the AutoTextList field. See the Letterhead Textboxes and Styles Tutorial for an example using some of Microsoft's default AutoText entries for letters. 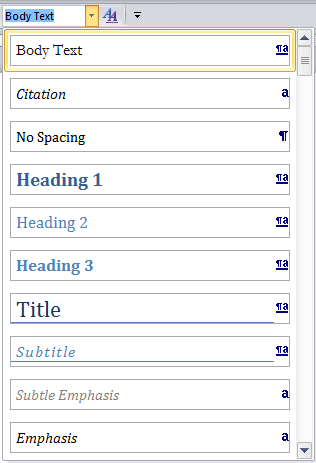 Tables of Contents are very easily generated in Word if you use heading Styles to mark your headings. See Complex Documents for more on how to do this. Creating a Table of Contents without using Styles is a painful experience, although it can be done. With a properly set up letterhead template the Styleref field can be used to put information about the addressee and subject into the continuation page header automatically. See the Letterhead Textboxes and Styles Tutorial for a detailed example. See my StyleRef Field Tutorial, Using Fields in Microsoft Word, and Useful StyleRef Field Tricks for more on the StyleRef field. The StyleRef field is especially handy because it updates instantly without any user intervention. A Style is a collection of formatting characteristics, such as font name, size and color; and paragraph alignment and spacing. A quick Style set is a collection of Styles that are designed to work well together. 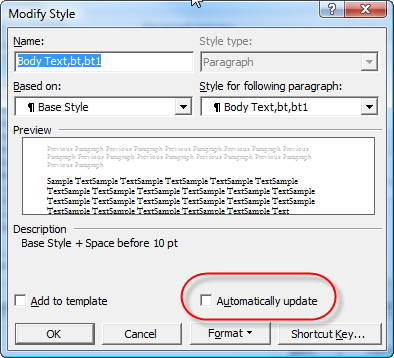 The built-in quick Style sets in Word 2007-2013 are called Distinctive, Elegant, Fancy, etc. You can also create your own Style sets. C:\Program Files (x86)\Microsoft Office\Office12\1033\QuickStyles ("1033" refers to US English). Word 2010: Office14 instead of Office12. Word 2013: Office15 instead of Office12. If you are running 64 bit Office on 64 bit Windows (or 32 bit Office on 32 bit Windows), the program files folder will be called Program Files (without "(x86)"). Your custom quick Style sets (those you create) are located in a completely different location. That folder will depend on your operating system. These are hidden system folders. If your Start menu has a search function searching for %APPDATA% will lead you toward the correct folder. Each Style linked in a Style set is called a Quick Style. Most Styles are not part of a quick Style set. Quick Style Sets do not contain Styles, themselves. They link to Styles in the template and the document and change certain attributes of those Styles. Quick Styles are also the Styles displayed in the Quick Style Gallery. The Home tab of the ribbon includes the Styles group. The Styles group includes the Quick Styles Gallery and the Change Styles button. When you choose a quick Style set for your document, the individual quick Styles in the Style set appear in the Quick Style Gallery. The Styles in the document that are part of a Quick Style Set will change when you change sets to the definitions in the new set. To see another representation of the quick Styles shown in the Quick Style Gallery - one that will be familiar to someone who has worked with Word 2003 and earlier - click on the sloping arrow in the lower right corner of the Styles group (or press Ctrl+Alt+Shift+S) to open the Styles Task Pane. This also shows Styles that are not Quick Styles, though. That is, you get access to all Styles (or can if your options are set to display not only recommended Styles or Styles in use, but all Styles). When you change to a different Style set, it changes two defaults in your document. Since the Quick Styles are based on those defaults, they all change. The first default is your base fonts. The second is which Styles are labeled as Quick Styles and displayed in your Quick Style Gallery. 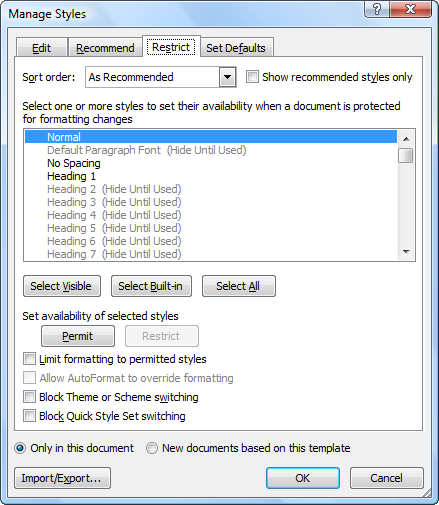 Quick Style Sets can only be used in Word 2007 and later. In all versions of Word, cascading Styles are available, though, where various Styles are based upon one another and a change to one Style can ripple through others. 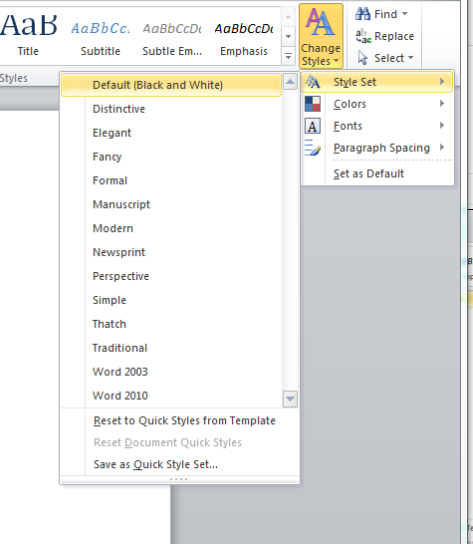 See How Styles in Microsoft Word cascade. This can give you many of the advantages of Style Sets in any version, but are a bit more work. The Quick Styles Gallery also allows the user to select the text formatted with a particular Style, and only text formatted with that Style. 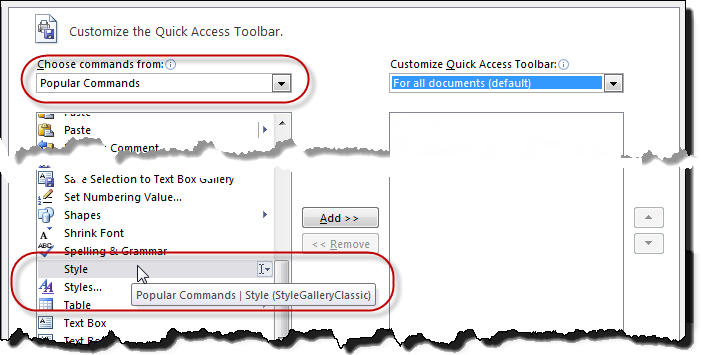 You do this by right-clicking on the Style name in the Quick Style Gallery as shown below. Once you have done this all instances of text in that Style (and not instances of text in a Style based on that Style or other Styles) will be selected in your document. A word count of the selection will appear in the status bar. The screenshot shows the result for a linked Style which has been used as both a paragraph and a character Style. Note, this works only with Styles that have been designated to appear in the Quick Style Gallery. Every Office theme defines two fonts — one for headings and one for body text. They can be the same font (used everywhere) or two different fonts. . . In addition, Quick Style Galleries for text and WordArt use these same theme fonts. Exactly what settings are changed when the Word 2003 theme is applied? Warning When you base a Style on No Style, you will need to set the Language because the default will be No Proofing. Sometimes when you apply a Style that has specific formatting attributes to text already formatted this way, the reverse formatting may occur. For example, when you apply a Style that contains bold formatting to a paragraph that contains some bold text, the bold text may lose its bold formatting. This problem will not occur if you apply character formatting— either through a character Style or direct formatting — after you apply a paragraph Style. 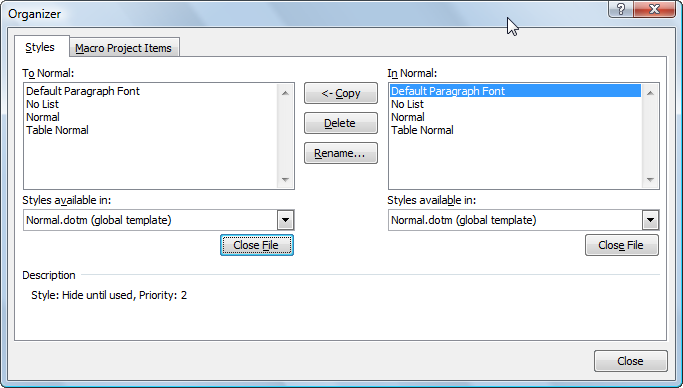 Apply the Style first, and then select the words to have other formatting and apply the formatting directly. Tip To make sure that no direct formatting has been applied to the text, first select the text completely and then press CTRL+SPACEBAR. This removes manually applied formatting. Now when a Style is applied, there is no reversing situation to occur. Apply a Style such as Heading 1 to text. Apply formatting such as Bold, Italic, and Underline to this text. In the same document, apply the same Style to different text and note that the text displays the same Style name but appears with different formatting. 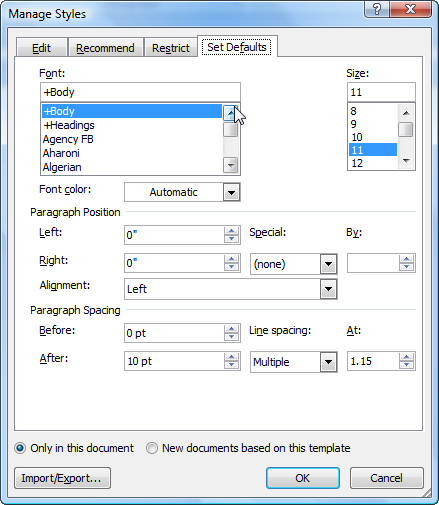 Select the Heading 1 text that has the directly applied character formatting applied in step 2. Press CTRL+SPACEBAR to remove the directly applied character formatting. Indent and center the text so that paragraph formatting is now directly applied on top of the Style. Press CTRL+Q to remove the directly applied paragraph formatting. The following is not in the original chapter. Copying text formatted with a Style from one document to another. When you copy text formatted in one Style to a different document, different things will happen depending on whether that Style is already in use in the original document. If the Style is based on a different Style, it will also matter whether or not that Style is in use. The basic rule is that if the Style is in use in both documents, the formatting of the Style in the target document governs. If the Style is not "in use" then the formatting of the Style from the source document will be carried into the target document and override a Style definition for that (unused) Style in the target document. Direct formatting can also cause problems. When you run into a problem with this, first undo and close your documents. Make some copies and work with the copies. Try first clearing any direct formatting in the source document text. Then copy and paste again. If your problem still pops up, then try using Edit => Paste Special... => Unformatted Text. You may have to reapply the appropriate Styles to the pasted text. The pasted text will pick up the paragraph format of the paragraph into which it is being pasted (even if the pasted text contains multiple paragraphs). To see something of how Styles interact when copied from one document to another, take a look at the IncludeText Field Tutorial. It shows what happens with Styles that are (1) in both documents, (2) only in the source document but based on a Style in the target document, and (3) only in the source document and not based on any Style in the target document. Changes I make to my default Styles don't stick! Changes to Styles are changes to the normal template (normal.dot or normal.dotm). When you tell Word you want a Style modification to apply to all documents based on this template, you are making such a change. A number of "Add-Ins" prevent these changes from sticking because of poor programming. There are three methods to get around this. The most comprehensive is to talk to the people who wrote the Add-In and get them to fix the problem they are causing you. The third is to open the normal template directly - as a document - make your changes, and save that. You do not want to put any text, including headers or footers, in the normal template! How to find or open the normal template in Word. See also Numbering Style Changes Won't Stick! As of this writing (Nov 2013) I have no explanation for this. 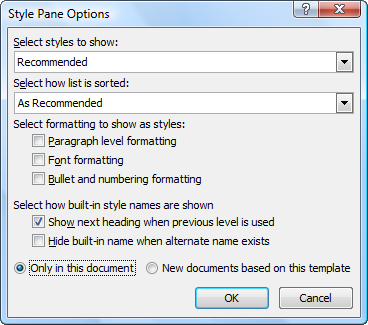 In Word 2010 (but not Word 2007) changing the Styles viewed in the Styles Pane expands the list of Styles shown in the Organizer (but not necessarily to showing all Styles). Note that it is rare to use the Organizer to copy Styles from the normal template; I can't think of any reason to do this. You can copy all of the Styles from the normal template (or any other template) by attaching the template to the current document with the option checked to update Styles from the template. You do not want to leave this option checked, though! Here is a macro that will do this.
' Applies stored Styles in normal template to current document.
' and normal template are stored.
' Word already knows that.
' Word 97 on but I've only tested it with Word 2010. See Installing Macros by Graham Mayor for instructions on what to do with this macro if you don't know. Automatically Update Styles - three controls with the same name spell trouble! 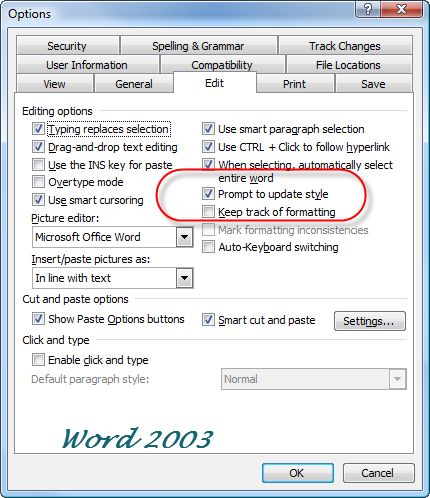 Word has three places where you can control automatic updating of Styles. Each controls something a little different, two should be left turned off as a rule, the third should always be turned on. The first is in the Style definition itself. The dialog box below is from Word 97, but the checkbox is in the Style modification / definition dialog for all versions of Word thereafter. Leave it unchecked! Finally, Word has had an option since Word 2002 to be prompted for a Style update. This was the default in earlier versions of Word. Leave that one CHECKED.